Professor Rweyemamu has been engaged in the global management of animal health for over 50 years. His impact has been immense and covers many aspects of the understanding and mitigation of the risks posed by disease in livestock and he was a central figure in the global eradication of rinderpest – for which he received a United Nation medal. His understanding not just of disease but the frameworks through which it is studied and research, managed and controlled, and ways to maximise the benefits that accrue from effective disease management has had global impact. Over many years he has directed, managed and influenced numerous national and international entities dealing with livestock disease management including the Food and Agricultural Organisation of the United Nations (FAO) and the World Organisation for Animal Health (OIE). 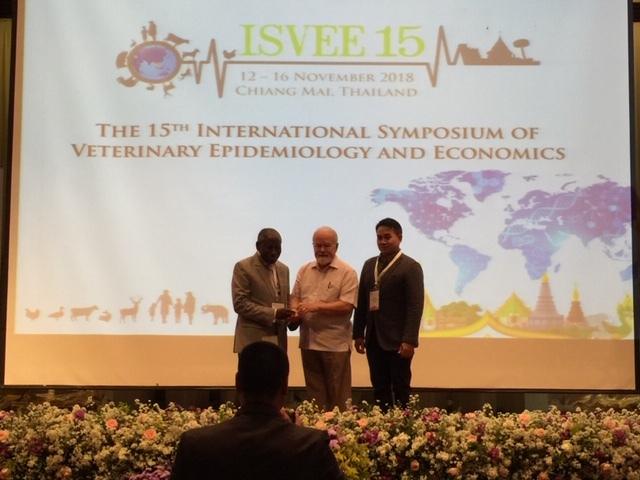 Peter Ellis ISVEE Award for the Application of Veterinary Epidemiology and Economics in Development: is awarded to a person for activities in veterinary epidemiology and economics carried out in developing countries, which contribute to improvements in animal and/or one health in those countries. Prof. Rweyemamu, who heads up SACIDS, Virtual Centre that links academic and research institutions in Southern Africa, SACIDS deals with infectious diseases of humans and animals, in an innovative partnership with world-renowned centres of research in high income countries, including the University of London Colleges that constitute the London International Development Centre (LIDC), notably the Royal Veterinary College – RVC – and the London School of Hygiene and Tropical Medicine -LSHTM, the International Livestock Research Institute (ILRI), other institutions in the USA, UK and Asia. This collaboration is further reinforced at the national level through forming national virtual centres for infectious diseases known as National Centres for Infectious Disease Surveillance (NatCIDS). Collectively, the NatCIDS form the core of SACIDS. SACIDS is set up with the overriding objective of harnessing innovations from science and technology to develop capacity in Africa for the detection, identification and monitoring of infectious diseases, with the view of managing the risk posed by them. The primary target was for those infectious diseases of either humans or animals that were of an epidemic nature, irrespective of whether they were emerging or conventional. So, One Health approach was adopted the right from the outset. It also involves the participation of: Muhimbili University of Health and Allied Sciences, Tanzania; Tanzania National Institute for Medical Research; University of Zambia; University of Kinshasa, DRC; DRC Institute for Biomedical Research; South African National Institute for Communicable Diseases; Mozambican National Institute of Health; and Eduardo Mondlane University Faculty of Veterinary Medicine, Mozambique. The Headquarters of SACIDS is located at the Sokoine University of Agriculture (SUA), Morogoro, Tanzania. Prof. Rweyemamu is a visiting professor at Sokoine University of Agriculture in Tanzania (SUA) and at the Royal Veterinary College, University of London, UK. Also serving as Principal Investigator and Deputy Leader of the SACIDS Africa Centre of Excellence for Infectious Diseases.